Three ingredients are essential for the Islamic movement to achieve success in bringing about change in society: an accurate understanding of the situation in which it operates; clarity about the goal it wishes to pursue; and, the process through which this would be achieved. This is also the lesson we learn from the Surah of the noble Messenger of Allah (SAW) when he proclaimed the message of Islam, first in Makkah and later in Madinah. He was absolutely clear about the jahili nature of society in Makkah, indeed the entire Arabian Peninsula and beyond, and refused to compromise with it. He set out to challenge and demolish it, and then replace it with a society based on Islamic principles and values. The process for this change was the mobilization of a group of people who were totally convinced that the message the noble Messenger (SAW) delivered was from Allah (SWT) and that the beliefs prevalent in Makkah inherited from their forefathers were wrong, illogical, and resulted in exploitation and oppression in society. The early Muslims were unconditionally committed to changing this situation regardless of the price they would have to pay. And bring change they did. At the end of the life of the noble Messenger of Allah (SAW) on earth, Islam had not only spread throughout the Arabian Peninsula, but an Islamic state had also been established and consolidated. It started in Madinah but expanded both east and west ultimately encompassing the entire Peninsula during his lifetime. The Prophet’s (SAW) successors expanded the Islamic domain to virtually the entire known world, spreading as far as Central Asia and China and into parts of Europe. This is the model Muslims have followed throughout history. Do people think that when they say, “We make a faith commitment to Allah,” they would not be tested with trials and tribulations? Lo! We tested those who were before you. Thus Allah distinguishes those that are sincere [in their commitment to Him] and those that merely feign and lie [about their commitment] (29:2–3). Thus challenges, adversity, and afflictions are part of the struggle committed Muslims must endure in order to achieve the goal of implementing Islam in society. This booklet is not a comparative study of the reasons for Iran’s success and others’ failures but we can say with confidence that both the Ikhwan and the Jamaat were endowed with the same quality of charismatic leaders as Iran, although they did not achieve the stature of Imam Khomeini. The Ikhwan and the Jamaat also had well-thought-out programs but because they did not adhere to their stated objectives fully and frequently made erroneous assumptions, success eluded them and continues to do so today. What we can say with confidence is that Islamic movements cannot gain power by participating in elections organized under the prevalent jahiliyah in Muslim societies. The experience of the Ikhwan (in Egypt), the Jamaat (in Pakistan), the Islamic Salvation Front (in Algeria) and many other movements that operate as political parties confirms this. Some may cite the examples of Hamas and Hizbullah and the successes they have achieved to support the argument that participation in electoral politics under existing systems can bring positive results. It must, however, be pointed out that their conditions are rather different. Their lands and societies are under direct foreign military occupation. They are forced to make difficult choices. Should they deal with the external enemy or tackle the internal situation first? The choices facing them are not pleasant and both carry grave risks. This book, however, is not about discussing the merits or detractions of electoral politics or even a comparison of different Islamic movements and their methodologies. 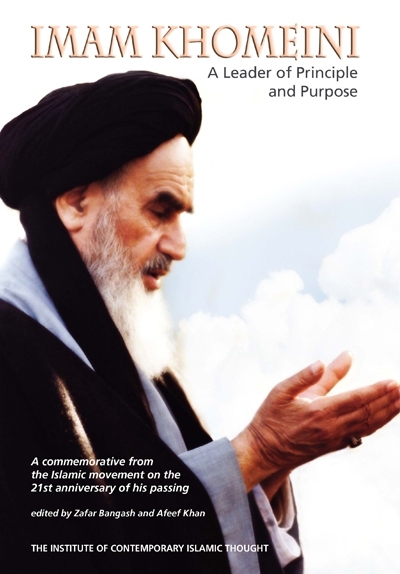 It is a humble attempt by a number of dedicated writers in the global Islamic movement to pay tribute to the late Imam Khomeini who passed away 21 years ago (6-3-1989). His death was marked by extreme grief both in Iran and beyond. Millions of people in Iran participated in his funeral procession in Tehran while tens of millions of others around the country were grief-stricken. This writer was on a speaking tour in Winnipeg, in the Canadian province of Manitoba at the time when the Imam’s death was announced. Within a few hours, Dr. Kalim Siddiqui had called from London advising me to take the first available flight to Tehran to join him at the Imam’s funeral prayers. My absence from Toronto made it impossible to do so. While I was prepared to cancel the speaking engagements in Winnipeg, the logistical difficulties made it virtually impossible to reach Tehran within the next few days. My passport was in Toronto; getting a visa from the Embassy of the Islamic Republic of Iran in Ottawa would have required several days even though Iran had announced that anyone wishing to go would be quickly facilitated with visa formalities. Sitting on this side of the Atlantic has its own difficulties; it takes a lot longer to travel from Toronto to Tehran than it does from London. Thus, much as I wanted to attend the funeral prayers and join in the ceremonies with millions of people in Iran, physical limitations made it impossible. It should be stated for the record that while an estimated three million people had welcomed the Imam on February 1, 1979 when he returned from 15 years in exile, more than 10 million people participated in his funeral prayers in Tehran in the scorching summer heat. The authorities in Iran had to urge people from outside Tehran not to come because facilities in the capital were stretched to the breaking point. The scenes at his funeral, as witnessed on television, were heartbreaking. What these demonstrated clearly was that the Imam lived in the people’s hearts. He had earned their trust and confidence through self-sacrifice and denial of worldly pleasures. He was bold and courageous but above all, he had unshakable faith in Allah (SWT) and His promised help. The people knew he was a leader of exceptional qualities but he lived a life that was very close to that of ordinary people in Iran. They also knew that he had no personal ambitions in life beyond adhering to the commands of Allah (SWT) and eliminating injustice from the face of the earth. These are the attributes of a truly great leader. This, however, is only one dimension of his multifaceted personality. Imam Khomeini came from a deeply intellectual tradition. From a very early age, he was immersed in the study of ‘irfan (gnosis) and mysticism. His interest in fiqh was aroused much later. It was clear even in his early life that he was deeply troubled by the injustices in society and he reflected on the causes of such malaise. He began to raise and discuss these issues at a relatively young age despite being quite junior in the hierarchical structure of the ‘ulama’ in Iran. But he was careful not to overstep his authority in the presence of senior figures. It was later when he had reached a more senior position that he began to express his views more forcefully, leading to his arrest by the Shah’s regime and ultimately exile from Iran in 1963. Exile, however, did not deter him from speaking out. He continued not only to speak but he also attracted large audiences. There was a yearning among people searching for a leader with courage, knowledge, and charisma. They found their ideal in Imam Khomeini. There are many dimensions of Imam Khomeini’s personality. This small book cannot address them all. It cannot even do justice to one aspect properly. It is regrettable that apart from Professor Hamid Algar, there have not been many scholars that have paid adequate attention to the Imam’s intellectual contribution in numerous fields. Most Muslims around the world have become familiar with the Imam’s writings and works through the pioneering efforts of Professor Algar or through the writings of Dr. Kalim Siddiqui in the Crescent International news magazine. In Tehran, there is also an institute established for the Compilation of the Works of Imam Khomeini. While it has done some good work, it is largely confined to literature in Farsi and perhaps some material in Arabic. The English works produced by the Institute are of questionable quality. What is needed is a team of dedicated researchers to concentrate on the writings and declarations of Imam Khomeini to make the rest of the world aware of them. There is a great deal about his intellectual contribution that in unknown to most people. Unless these works are properly researched, analyzed and discussed, the world would remain unaware of Imam Khomeini’s contribution in many fields. Even his widely known achievement — leading the Islamic movement to bring about an Islamic revolution in Iran — is not properly understood; even many Muslims do not understand and hence do not appreciate it fully. Some of it is undoubtedly the result of negative propaganda in the Western media, and its “Muslim” analogues in such countries as Saudi Arabia and Kuwait. The West’s animosity toward the Imam is based on the loss it suffered in Iran. He overthrew the West’s favorite puppet and demolished the Western-imposed exploitative system in Iran. This was a major blow to Israeli and American interests. More importantly, by bringing about the Islamic revolution in Iran, the Imam challenged the imposed world order managed by imperialism and Zionism. This the West could not tolerate, hence the incessant hostile propaganda and negative portrayal of the Imam. They could hardly be expected to extol his virtues. The Islamic state of Iran continues to be viewed with great hostility even today precisely because it refuses to surrender to the West unlike other regimes in the Muslim world. The Western media’s hostile propaganda is one dimension of the problem. In fact it is confirmation of the fact that the Imam had embarked on a course that was viewed by imperialism and Zionism, the two leading sources of zulm in the world today, as a challenge to their exploitative and anti-human policies. But what explains the hostility of such states as Saudi Arabia, Kuwait, and Iraq under the now defunct Saddam? These bastions of Arab nationalism are illegitimate entities that were created by Western colonialists to serve their interests. By bringing about an Islamic revolution, the Imam’s successful struggle against a ruler in the molds of all these other rulers, exposed them completely. This was especially true in the case of Saudi Arabia whose kings had wrapped themselves in the mantle of “Custodians of the Two Holy Cities.” Muslims worldwide were forced to ask: how could the custodians of the Haramayn be subservient to the kafirs and the sworn enemies of Islam? The hostile propaganda against the Imam was confirmation that he was not working for personal interests and that his mission was dedicated to the service of Allah (SWT). But such propaganda does not fully explain the lack of knowledge among Muslims and other people about the Imam’s immense contribution in such diverse fields as the understanding of the Qur’an, the Hadith, ‘irfan, fiqh, theology, Muslim political thought, etc. In any case, we should not give too much credit to the Saudis and their ability to influence events in the Muslim world. What is really lacking is the will and a well-thought-out plan to study the Imam’s contribution. This is an area that awaits serious consideration and attention. There is also another difficulty that has to do largely with the internal situation in Iran. Almost everything there is governed by the immediacy of the moment. There are so many challenges facing the Islamic Republic that there is not adequate time or resources devoted to long-term study. This is further complicated by the fact that almost everyone in Iran is pursuing his own “Line of the Imam.” Thus, as there are far too many groups claiming to follow the “Line of the Imam,” it is anticipated that many of them are working at cross-purposes with each other. This needs to be brought into some kind of order. The Islamic Republic also commemorates the Imam’s anniversary each year. Guests are invited from all over the world. Papers are presented and conferences held. The commemoration ceremonies culminate in a huge rally at the Imam’s mausoleum in Behesht-e Zahra Cemetery. Why has a committee of scholars not been appointed and provided facilities to undertake serious research into the writings and ideas of the Imam? It serves little purpose to produce numerous volumes of material of dubious quality and assume that nothing more is required. True, people continue to have a deep attachment to the memory of the Imam more than two decades after his departure from this world but his intellectual contribution is of a much higher order and needs to be addressed at the proper level. This small booklet is a humble attempt to get a glimpse into the very rich and eventful life of the Imam. I am grateful to the contributors for agreeing to write papers at such short notice. This book has been put together, literally, in two weeks, hence the rather sketchy presentations. Given more time and resources, a great deal more could have been achieved. Lack of time has prevented us from dealing with subjects in more depth or dealing with diverse subjects related to the life of the Imam. Perhaps one subject that can be addressed in detail in the future is a comparison between the methods employed by the Imam in steering the Islamic movement in Iran to success and the failure of other movements in achieving this goal. This would provide important lessons for the global Islamic movement. It is through the process of learning from our successes as well as failures that we would be able to better tackle the challenges confronting us. We pray that this humble effort would be received in the spirit in which it is written: as a genuine attempt to shed light on a very small part of the Imam’s great life. It is not an academic work; rather, it reflects the views of the contributors focusing on certain specific aspects. We hope others will take up the challenge and do much more because a great deal more is needed.